Luka Bloom signalled a change of mood last year on the superb covers album, "Keeper Of The Flame". Now his latest finds the Irish troubadour at his absolute peak. Here's a man who, if he hasn't found love, gives a remarkable impression of it here. "Between The Mountain And The Moon" is a majestically romantic collection of ballads, that, from the opening paean to love, "Monsoon", just sweeps you along on its powerful, poetic current. Bloom is joined by Sinead O'Connor's vocals on several tracks, including the seductive "Come in Love" and gorgeous "Love Is A Place I Dream Of", written for Christina Noble, the Dublin-born Australian who has devoted her life to orphans in Vietnam (a version featured on the documentary about her, Mama Tina). Among other outstanding ballads are the swooning "Here and Now", while "As I Waved Goodbye" celebrates the Tibetan ideal. Bloom turns to a jaunty, Indo-Celt beat on "Perfect Groove", and "I'm A Bogman" revels in sheer Irishness. Due back here next March, Luka Bloom on this form is not be missed. A premier singer/songwriter returns to form. ...The result is an album of glorious songs lovingly smudged with one of the greatest folk music traditions on the planet..... There is a certain mellowness about this beautiful album... Here he has refuelled his creative "acoustic motorbike" with an album full of freshness and melodic surprises. This is arguably the best and most coherent album Bloom has ever produced. Indeed, he fairly shouts his heritage from the mountains on "I'm A Bogman". That track aside, this is a starkly beautiful recording, reaching its zenith on "Love Is A Place I Dream Of", a duet with Sinead O'Connor. After Luka's last album "Keeper of the Flame" was a collection of covers given the Luka Bloom treatment but you need to hear a song like "Gabriel" to fully understand his sensibilities. Sinead also features ever so subtly on "Moonslide". It is typical of the hypnotic trance Luka is capable of working his audience into in a live performance. What we have here is just two voices and an acoustic guitar. It is a stunning moment off the album. ...Bloom's 'Between the Mountain and the Moon' is a collection of evocative folk songs that recall a time when singers were expected to be poets with a message. His songs are all wholly earnest, to the point of being almost painfully so for a listener raised on rock songs delivered with that perpetual wink. But Bloom, despite his anachronism, still stretches the definition of folk, often with surprising results. Nowhere else will you find a song so traditionally structured as 'As I Waved Goodbye' that it sounds both ancient and immediate, yet treats the subjugation of Tibet in its lyrics. 'I'm a Bogman' is a proclamation of love for Ireland, yet it explodes with flamenco-flavored trumpets. The opening track, 'Monsoon' simply is gorgeous, with jangling guitars and subtly swelling strings serving as the backdrop for Bloom's hypnotic, slow rap: "Every day is the rainy season / Every night is a full moon / Whenever I'm with you, darling / Love is a monsoon." 'Monsoon' is a perfect album opener, presaging the slew of sensitive, sometimes hopeful, sometimes resigned love songs to follow. 'Here and Now', the follow-up to 'Monsoon', arrives and departs as stealthily as its title suggests. But 'Here and Now' is typical of the album in its sometimes clunky lyricism, striving too hard for art: "I don't find the rocky place / That was yesterday's revelation / So much yellow silken hair / Left behind to bathe in." Bloom does better when he drops lines that merely suggest a scene: "They're playing hornpipes, jigs and reels / Just outside my window." He does best when he sings a simple truth: "I get shaky under blue skies / That's just the way it is, sometimes." Fellow Irish singer Sinead O'Connor lends her voice on 'Between the Mountain' but is mindful not to overpower Bloom's mellifluous, gentle tenor with the unmistakable yearning strains that dominate her own albums. O'Connor and Bloom sing octaves on the choruses of 'Moonslide' and 'Love Is a Place I Dream Of', but on 'Soshin', O'Connor treats her voice as the truly original instrument it is, proffering a winding, humming countermelody. 'Soshin', a character study of an Irish girl, is careful not to sketch her too distinctly. The result is a poetic, flickering image of a girl that complements the elusive, minor guitar strums that turn major for the chorus: "Everybody I tell wants to know you / Soshin". The somber tone of 'Between the Mountain and the Moon' wears thin when it trades its Irish lilt for deathly seriousness. The long, quiet chords of 'Gabriel' lend the song more weight than the lyrics can support. 'Hands of a Farmer' falls into the same trap, though the song is recovered by its more grounded melody and keening flute. As a whole, the album is redeemed by its generosity; Bloom's songwriting is bare and honest, despite the sometimes lush instrumentation.... Luka Bloom is an artist destined never to reach a widespread audience in America, where people are listening hard for the smirk in a song. It's a shame. But those who do pick up 'Between the Mountain and the Moon' can expect to be let in on a wonderful secret. 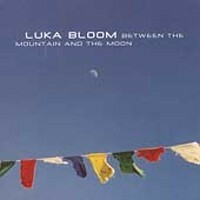 Luka Bloom is the chosen nom de plume of Barry Moore, younger brother of Ireland's acclaimed folk legend Christy Moore. There's little similarity other than a certain tonal hint - Bloom's songwriting is more informed by US and UK contemporary folk idioms than Irish. This is his first release under his own steam, and by and large it's an exemplary collection. Let down solely by the sheer ordinariness of Rainbow Day, the rest of the album is enhanced by strong production, some excellent, considered lyrics and Bloom's clear-as-a-bell voice. Recommended. The brilliant blue sky accented by multicolored prayer flags on the CD sleeve could be an apt metaphor for both the diversity of the musical contents and the subtle spirituality within Luka Bloom's latest release, "Between the Mountain and the Moon". ... His third independent release and follow-up to "Keeper Of The Flame", his well-received album of covers, "Between The Mountain And The Moon" is classic Bloom - a collection of strong songs, with no shortage of unexpected instrumental and lyrical twists. Opening on a relatively subdued note with the gentle, spoken-word, "Monsoon", it's clear that he's in a completitive, introspective mood, the Middle Eastern rhythms lending it a strange mystical quality..... More straightforward love songs such as the soaring "Here & Now" and the gorgeous "Love Is A Place I Dream Of" find him on more familiar territory..... If there is a theme running through the album it's one of return to the land, spiritually as well as physically with wild, rough landscapes and heavy weather predominating lyrically. "Hands Of A Farmer" is dedicated to traditional legend Micho Russell while "I'm A Bogman" which could be construed as a comical throwaway is, on the contrary, a deadly serious affirmation of Bloom's true roots in "the precious wetlands... where the heather and the moss grows." Other highlights on this exquisitely produced album include "Moonslide", "As I Waved Goodbye" and the autobiographical "Rainbow Day". Arguably, his most fully realised collection of original songs yet. Although the Irish singer-songwriter's sixth album is often as subdued as it is sensual - most of the songs don't have drums - this might be the one to give him a David Gray-like shot at belated mainstream attention. His mix of humid romance (Monsoon), tributes to fortitude and dedication (Love Is a Place I Dream Of, a duet with Sinead O'Connor, honors a Dublin woman who works with homeless children) and music informed by both his cultural roots and a global perspective is a seductive package. Irish singer-songwriter Luka Bloom's sixth release is a polished collection of thoughtful, evocative songs delivered in a variety of subdued styles. While he often writes of love's sometime tempestuous state, other songs recall a time when thoughtful songwriters were expected to deliver a message. Like an Irish version of Texan Alejandro Escovedo, Bloom backs his songs with guitar, flutes and lush strings, cutting deep to the heart and soul, and basking in images of home, heritage, faith, heroes and simple moments of perfection. He duets with Sinead O'Connor on "Love Is a Place I Dream Of" a tribute to a Dublin woman who works with homeless children. The sensual opening track, "Monsoon" is a gorgeous paean to love: "Every day is the rainy season / Every night is a full moon / Whenever I'm with you / Love is a monsoon." Back in 1999, Luka Bloom played a rousing set at the last Fleadh in Golden Gate Park in San Francisco and followed up later in the week with a memorable, extended concert at Slim's. He previewed a number of new songs that night and now they can finally be heard on an album. "Between the Mountain and the Moon" is the most mature, unified and joyful album Luka has ever released. Apart from the quality of the songs, the album is seductively sequenced, beginning with a couple of Luka's typically rhythmic lullabies, "Monsoon" and "Here and Now". Then he slides into The "Perfect Groove" before the whole album takes off on a series of sweetly meditative, Leonard Cohen-like grooves. On "Love is a Place I Dream Of", Luka's voice melds deliciously with Sinead O'Connor in a heavenly harmony. This was the only track O'Connor was recruited for but when she heard the other songs she stayed around to add vibrant vocals to some other tracks, including "Moonslide". Other talented collaborators on the album include Luka's nephew, Conor Byrne on flute, Martin O'Connor on accordion, Gavin Ralston on guitar, and Eamon Murray with some delightful harmonica playing. Over the many years of their overlapping careers, Luka had never recorded with his brother, Christy Moore, until 1999 when they issued a novelty song called "I'm A Bogman" as a summer single. The version on this album does not have Christy but it gets a full treatment complete with a brass band backing that wouldn't be out of place at a New Orleans funeral. Luka comes across as a cultured, classy, swinging, sophisticated "culchie"-and proud of it, man. This could be the most Buddhist album ever produced by an Irish artist. The cover photo is of prayer flags outside a Buddhist center in the Beara Peninsula. "Soshin" is dedicated to Maura O'Halloran, an Irish woman who became a Zen Buddhist monk in Japan. "As I Waved Goodbye", based on the book "Seven Years in Tibet", was one of the songs he sang at the Slim's gig, accompanied only by an instrument he called his musical handbag. "Rainbow Day" chronicles the simple delights of good days and the eternal hope of finding love along the way. It contains the Zen-like exhortation: Squeeze the juice out of the day. He closes the album with a paean to the late Micho Russell, one of the great storytellers and musicians from Clare. "Hands of a Farmer" is a lyrical and evocative song with soaring whistle from Conor Byrne. Luka's paints that spirit succintly: Hands of a farmer / And dreams of a child / Your melody lingers / Through a winter too wild. Luka's last album, "Keeper of the Flame", featuring covers of some of his favorite songs, was a little too reverential for my taste and only one track, the U2 song "Bad", possessed that fiery energy that made his version of "I Need Love" such a great remake. Luka attributes the gentler tone of this album to becoming comfortable in the studio (Windmill Lane in Dublin). But it also sounds like the work of a artist whose vocal abilities have been underrated over the years, finally settling into his skin and achieving a peace with his gifts and struggles. His best in years; from Windmill Lane with strings, brass and Sinead O'Connor in tow. Emerging like a butterfly from the cocoon of Irish folkdom with 1990's "Riverside", the bicycling global troubadour - his name borrowed from Joyce's Ulysses and Susanne Vega's hit - forsook his New York based major label career in 1997 and returned to Ireland. Five years on, he has once again, harnessed a new level of inspiration. His writing has found maturity, honing a hitherto slightly hippy-drippy worldview into a Zen-rich, poetic humanity, while his musical approach follows fresh paths. "Perfect Groove" takes the ghost of Nick Drake's Cello Song and makes it Bloom's Alright Now, while "Hands Of A Farmer", eulogising the late Micho Russel, is chillingly beautiful, epic yet humble. The Dalai Lama would, were it not a contradiction, surely be proud.